KIMONOKOUEI is a kimono rental shop in Ginza Tokyo. From high-class kimono for formal parties and ceremonies to casual kimono for sightseeing, there is various types of kimono for rental. All the things needed to dress up in a kimono are included in the rental plan, nothing to be prepared. 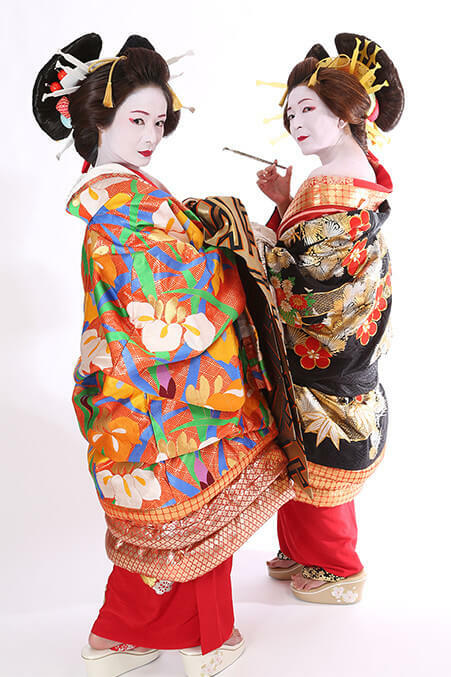 Our kimono are also used in media such as Japanese TV programs and model shooting. Our kimono specialist is pleased to give you professional advice on kimono. Please feel free to contact us. We strive to provide comprehensive services for you to make nice memories in Japan. 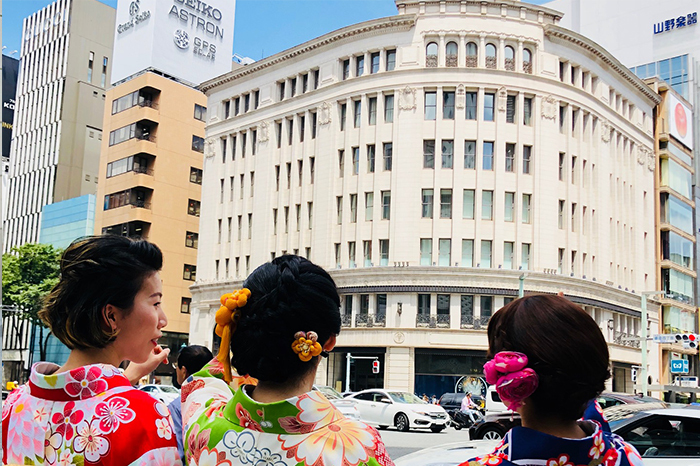 Enjoy Ginza in a kimono! 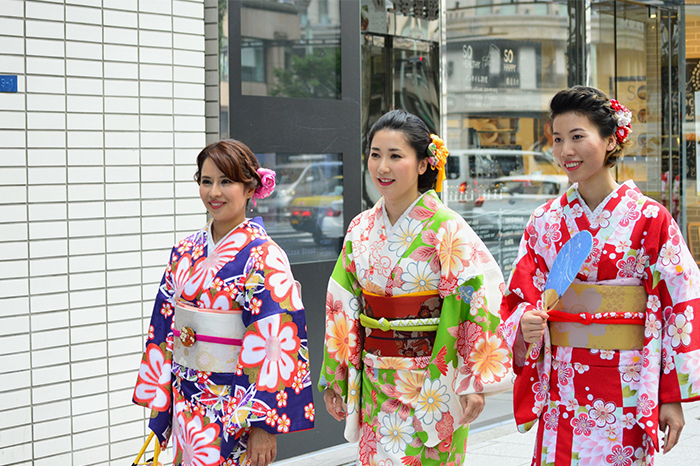 'Ginza stroll in a kimono' plan provides kimono rental and dress-up services for you to wear kimono to stroll around in Ginza. Ginza is one of the leading shopping districts in Japan where you find an array of brand shops and famous department stores. Besides, there are many famous spots such as Kabuki-za, high end Japanese restaurants and rooftop garden. ・ Plus ¥1,080 (including tax) to have a hair set. ・ Rental services are available from 10:00 to 16:00. "Ginza stroll in a kimono" plan? 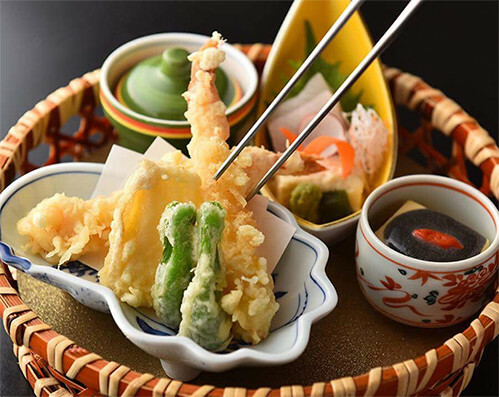 Let 's take a tour of Ginza's power spots to have more good luck! There are numerous unknown power spots in Ginza. 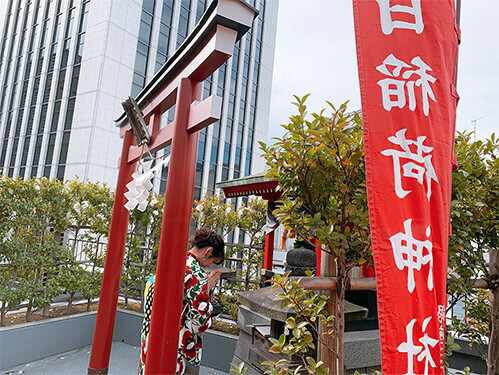 The picture shows the Asahi Inari Shrine located on the rooftop of building in Ginza. This is one of the Ginza Hatcho Jinja Shrines, visiting shrines to pray to the Seven Lucky Gods, wish for prosperity in business, marriage tie and household safety. There are various types of kimono to wear on formal occasions, such as a wedding party or a ceremony. Kimono which are made of silk and decorated with luxurious embroidery is suitable for formal wear. 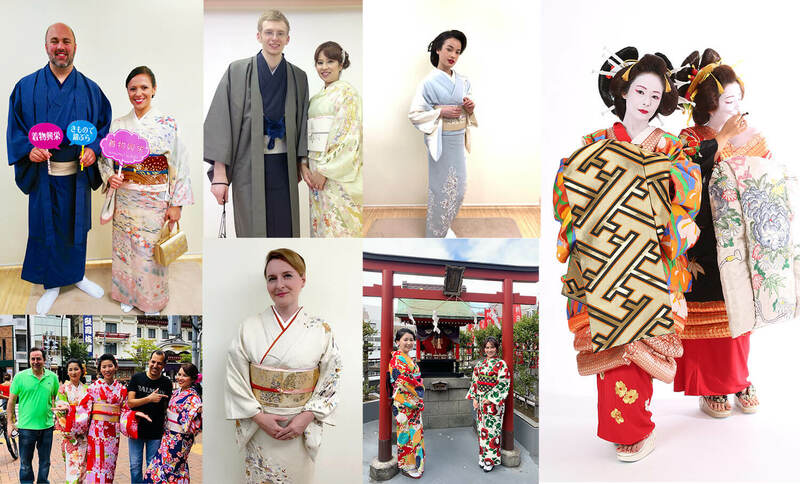 We will choose the best type of kimono for you according to your needs and occasions. Studio Shooting only, without going out. Please choose your favorite costume from among Maiko, Geisha and Oiran. Plus ¥10,800 to purchase digital pictures (CD-R). A 5-minute walk from JR Shinbashi Station, a 6-minute walk from Tokyo Metro Ginza Station, a 11-minute walk from JR Yurakucho Station If you need further assistance, please call us (Tel: 03-5568-1888). Copyright© KIMONOKOUEI All Rights Reserved.